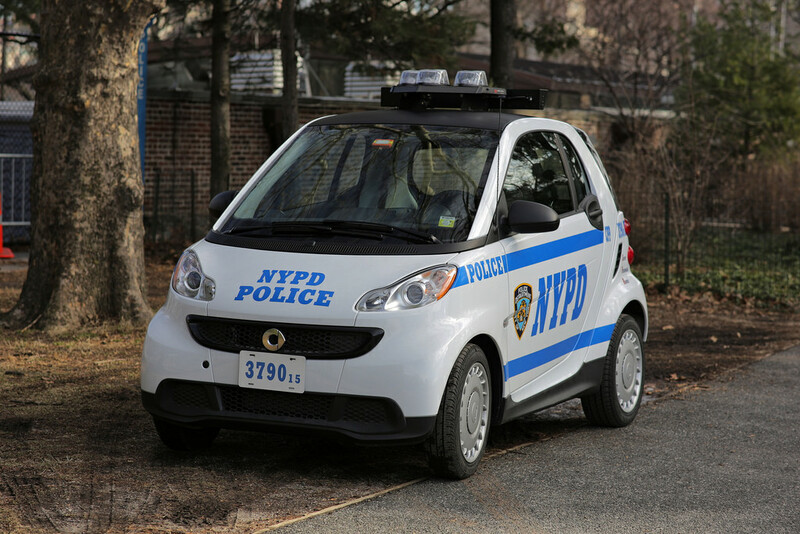 Apparently, the NYPD is using Smart Cars to patrol certain areas and streets instead of using their old scooters. They won’t be using these cars to chase criminals. Or have shootouts in the streets like in the movies. Just regular patrolling. Which would be fine, if NYC cops weren’t big guys. Have you even seen how small this car is? In both of the linked articles above, it’s compared to a clown car. And have you seen most cops in NY? They’re not exactly teenage sized. Most of them have to wear several layers of gear (just in case), and are pretty buff from what I imagine is exercise routines for situations (of the “just in case” kind). So imagine my face when I saw 2 such gentlemen in the cabin of this smart car. I almost peed myself from laughing. Those poor guys looked like they could barely turn around. I hope the police are not using these to be intimidating. Because I don’t think they could get out of fast enough to catch me if they saw me laughing at them. However, I didn’t feel scared when I saw them either. Which is probably a good thing. Personally, the general public doesn’t need to see scary cops 24/7. Most of us are good people. Keyword here being, most. And seeing a gentle car patrolling, did indeed make me feel safe without making me feel scared. I think that’s the purpose of these cars. Presence, but not intimidation. They still have their regular cars for intimidation. But most areas don’t need intimidation, they just need to see the presence. Although maybe they could use a slightly bigger car to do so.